"Deep inside the jungle where nature's running wild / Coming to the rescue is a very special child / Talking to the animals and swinging from a vine / This rough and tough adventurer is working all the time / Ya viene Diego. Diego. Diego. Go, Diego, Go!" Lions, lions everywhere! Earlier in the month we reviewed Pinkney's Caldecott medal winning book, The Lion and the Mouse. 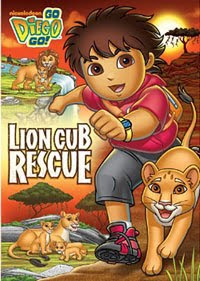 This week we watched the newest Diego DVD, Lion Cub Rescue . "Welcome Home, Lion Cub!" - Diego and baby Jaguar visit the grasslands in Africa and help Lion Cub and the Lion Cub's daddy rescue lion family members while traveling back to the pride for Lion Cub's party. They rescue Baby Lion from a stream's rapid water, free Cousin Lion from a net animal trap and locate Sister Lion hiding in the tall grassy field. "Diego's Ringed Seal Rescue" - The Ringed Seals live in a special rescue home in the arctic because their snow caves have melted. Diego and Alicia work together to save Baby Ringed Seal "Susie" from a polar bear and bring her safely back to the Ringed Seal Rescue Center. Along the way, Susie must navigate through an icy path, dive in and out of ice holes and find her way in a snow storm. "Diego Reunites Hippopotamus and Oxpecker" - Hippopotamus must relocate from his river home to Hippo Lake and his "symbiotic" friend Oxpecker accompanies him on his journey. Hippo relies on Oxpecker to eat the bugs off his back and keep him clean. When Oxpecker searches for water plants for Hippo to eat, the rushing water pulls him toward a pipe entrance. While Diego and Hippo journey to save Oxpecker, they stomp through tall grass and hippo gets overheated and searches for a water hole to cool off. "Diego's Orangutan Rescue" - Diego travels to the rain forest Island of Borneo and together with his friend, Burgin, they help out the orangutans. Baby Orangutan floats away down the river in a canoe and Big Sister Orangutan asks Diego for assistance. I like the animated Diego episodes and DVDs because they introduce my children to environmental issues in a child friendly way. The short episodes can be used in conjunction with books and other curriculum to teach kids about different types of animals and their habitats. Kids also learn Spanish words and the shows enourage movement and interaction. Both my children really enjoy singing along to the special songs incorporated in the shows. My daughter's favorite episode on this DVD is the one about the Hippo/Oxpecker. Even I didn't know what a "symbiotic" relationship was prior to watching this episode. You learn something new everyday, even from Diego! SpongeBob SquarePants: Viking-Sized Adventure DVD also releases today. This is the description according to the fact sheet: "Join SpongeBob and his pals as they go on a Viking-Sized Adventure, weather a storm, fill in for super heroes Mermaid Man and Barnacle Boy and meet Mr. Krabs grandpappy the pirate. Guest stars include Dennis Quaid and Ian McShane!" My kids are a little too small to enjoy the humor in this one, so I'm giving away my SpongeBob review copy to a Brimful Curiosities reader. To enter, leave a comment with the name of your favorite Nickelodeon show or character. • Contest ends on Monday, February 8th, 2010 at 11:59 PM CST. My son would say Spongebob - but I say King Julien from The Penguins of Madagascar! My favorite Nickelodeon show is Backyardigans. My favorite Nick show is Spongebob, closely followed by The Fairly Oddparents. Goodness, what don't we like? We like Diego and Backyardigans. My favorite show is The Fairly Oddparents. Thanks. My son loves the new show on Nick, Fresh Beat Band, but Spongebob is a favorite too. I subscribe in reader. Thanks! Spongebob hands down. He is such an upbeat character. Of course my little girl is watching Dora at the moment, but we still go with Spongebob. Hello, Face here! My favorite Nicktoon was The World of David the Gnome. A more current favorite is Jimmy Neutron. I'm a big Spongebob fan. There's lots of Diego love at our house! I'm going to go old school: my favorite Nickelodeon character of all time is Clarissa. I'd have to say Spongebob too. I love SpongeBob, but Dora is a very close second. Thanks for the great giveaway! My grandson would probably say both SpongeBob and Diego. He really enjoys watching both of their shows and DVD's.